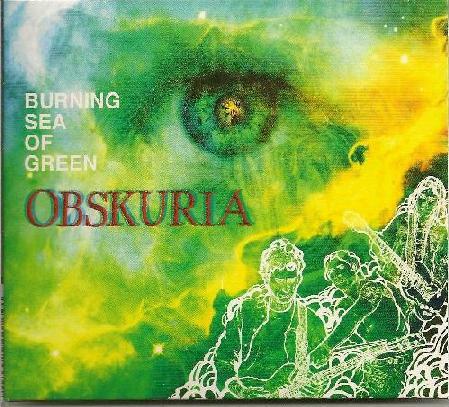 Obskuria - "Burning Sea of Green"
Obskuria is a multi-national group (featuring members from Germany, South America and the U.S.) who occupy that very gray zone between old school heavy metal and neo-psychedelia, fusing elements of both into a kind of 21st century testament to both genres. There are shades of Deep Purple (particularly evident in the driving Jon Lord-inspired organ of Sandra Disterhöft), echoes of Pink Floyd and even paraphrases of such "classic" 70's rock icons as Led Zeppelin, Uriah Heep, Black Sabbath and The Doors. Some of the songs read like direct homages to the group's influential ancestors; thus, Black Magic takes its fuzz-drenched middle eastern exotica straight from Zeppelin's Kashmir while the fast-paced rocker Why? sounds eerily reminiscent of any particular track by Purple from the glory days of Machine Head. But Obskuria definitely has a voice of its own (albeit inconsistently on Burning Sea of Green). Screaming like a Whirlwind, while clearly evoking images of Ritchie Blackmore's guitar histrionics at their most awe-inspiring, is a blazing rocker racing toward nuclear oblivion. It features excellent guitar pyrotechnics and an effective rhythm section that propels the track to a frenzied climax. The extended title track is unquestionably the most self-consciously experimental piece on the album. Lots of glissando guitar effects, tremulous organ and a relentless rhythm section merge into an acid freakout that references the Airplane at its lysergic finest, without however attempting to simply recreate the ambiance of 1969. Burning Sea of Green will appeal to fans of 60's psychedelia, 70's metal heads, and more peripherally to aficionados of space rock and neo-psychedelia.